What's so funny about being on the run from the cops, handcuffed to someone who's not so sure of your innocence? Everything, in Patrick Barlow's adaptation of Alfred Hitchcock's The 39 Steps. In the University of Vermont Department of Theatre production of the popular comedy, six actors race through more than 30 interior and exterior locations, summoning up every film convention for suspense. It's a play about the movies, and putting it onstage means actors assemble the effects before our eyes. Adaptations can take liberties, as Hitchock did when converting John Buchan's 1915 novel into a 1935 movie. But if the filmmaker played fast and loose with the plot, Barlow transforms a thriller into a comedy. He not only encapsulates the main events of the movie, he throws in the crop duster from Hitchcock's North by Northwest and a handful of punning references to the filmmaker's entire oeuvre. A chance encounter with a mysterious woman hands Richard Hannay a cryptic clue in the name of a Scottish town. He can't pry much more from her, not least because of her thick German accent, but when she's murdered in his flat, he sets off to foil the spy ring that terrified her. The espionage afoot is so one-dimensionally heinous that the viewer must simply hold on tight and count everyone in a trench coat a bad guy, and everyone in Hannay's way an unwitting obstacle to the future of civilization. Since Hannay is now wanted for murder, he has to dodge the police while trying to save the world. Guest director Cristina Alicea, the producing artistic director of Vermont Stage Company, showcases the energy of the six actors with a flurry of action and a snappy, comic pace. Scene changes are torrents of activity. The actors hustle furnishings on and off in delightful bursts of frenetic energy, and a new scene starts before the perfectly trimmed lampshade stops shaking. Alicea incorporates slow motion and the sense of a moving camera while Hannay eludes cops on a train, slogs through moors, dangles from a bridge and generally does a great deal of surviving. Nearly every scene includes physical feats, witty banter, quick-change stunts, character-based humor, and verbal or visual puns. If one or two laughs are lost, plenty of other gags keep things rolling. In the train scene in this production, one actor rushes some nutty banter as a lingerie salesman; those jokes don't land, but a nervous Hannay, squirming to conceal himself, earns chuckles. As Hannay, Christian DeKett is the picture of a genteel Englishman, suave and just a little bit vain. He sets a tone of urbane swashbuckling — dodging danger counts for nothing if you break a sweat. DeKett is excellent at finding the beat to land his barbs, and his physical pliability is much on display in a lovely string of escapes. Whether he's slinking low behind a sideboard or falling off a bridge, he shows the offhand athleticism of a British hero. DeKett makes Hannay unflappable; no matter the peril, he always finds time to resettle his hat. The play can be done with just four actors, but UVM gives the three female roles to individuals. Sami Schwaeber, Sarah Kolozsvary and Elizabeth Callahan play a love interest, a femme fatale and a farm wife, respectively. Alicea emphasizes the comedy in these roles, not the underlying motivations of characters in the thriller genre. All three get to flirt and test the sexual tension with a hero straining to keep his composure. Sam Hall and Luke Lakea, with the help of plenty of hats and spectacles, play a bevy of characters of all genders, ages and occupations. Just as movies fill the frame with incidental porters, constables and rustics, this play demands the same flourishes but without the allowance for editing. With clear enthusiasm, Hall and Lakea switch accents and costumes to form a two-man crowd scene or take up the parts of the bumblers and masterminds that impede Hannay's quest. Kate Fulop, a UVM theater alumna and now a professional costume designer, returned to campus as a guest lecturer and created a raft of costumes that perfectly evokes the 1930s setting. Fulop doesn't settle for anything but just the right hat and gives a Scottish innkeeper a sporran to accessorize his kilt. The women's costumes capture the period with just enough hints of sultriness to make them movie-star grade. Jeff Modereger's set design mixes realistic chairs and fireplaces with the rough items of a construction site — sawhorses, a pair of ladders, assorted benches. These workaday items become everything from a train car to a bridge, and watching the actors transform them is an essential pleasure of the play. 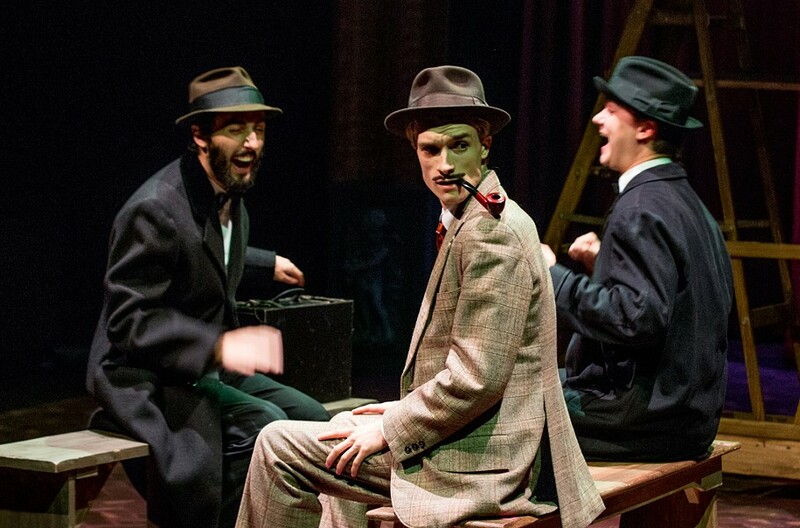 A program note struggles to justify the carpentry gear as part of Hannay's apartment restoration, but the play is better performed with magic than explanations. It's certainly not all happening in Hannay's head — half the fun is the distance he travels. The sound design by Zach Williamson uses incidental music in the manner of Bernard Hermann for a perfect expression of the film's mood. Williamson also fills out scenes with sound effects, adding subtle texture. The refurbished Royall Tyler Theatre now boasts a sophisticated audio system. This production takes advantage of it with sound that can be located precisely, losing nothing at the low volume necessary to create atmosphere. The best parodies are built out of love for their subjects. Barlow packs his script with one-liners and stretches clichés to the snapping point, but he starts with a true appreciation for the suspense genre and what makes it tick. This production often neglects to lay the foundation in each scene, starting to make fun of a tense plot before any tension can be felt. But cutting to the jokes, even more than cutting to the chase, is plenty of fun. The original print version of this article was headlined "Great Escapes"